In 1956 the Session of the First Presbyterian Church in Haddonfield initiated the beginning of a new church for the neighboring township. The “new church” committee decided to call the church “Trinity” and in May 1957 the first worship service was held for 95 adults and 45 church school children, at the Erlton School. Trinity’s first sanctuary was in the basement of an office building on the current property. A converted materials shed later served as a second, larger sanctuary. This was transformed into a Social Hall when the present sanctuary was completed in 1965. 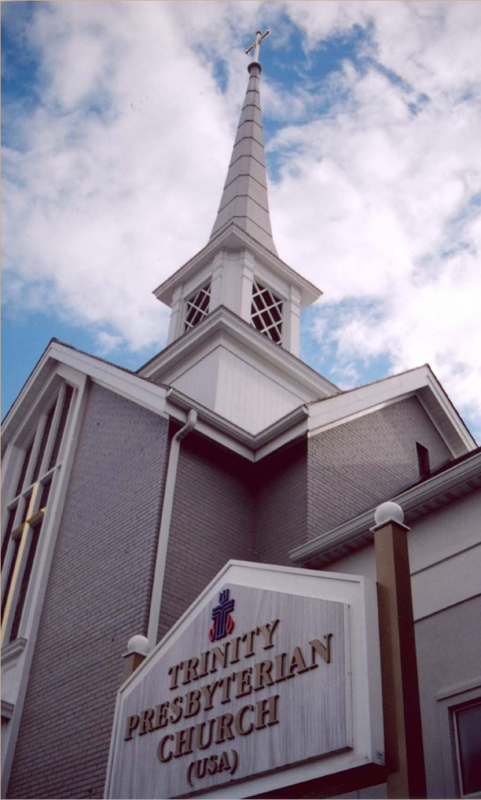 On the 40th anniversary of Trinity Church in 1997, the congregation launched a capital campaign for the completion of the church buildings as they stand today. Dedication of the new building took place on Sunday, June 3, 2001. Framing the large windows in O’Dell Fellowship Hall are wooden beams salvaged from the original shed/social hall. These towering beams remind us of our humble beginnings and the importance of our past while directing our vision to the promise of a bright future. believe the Holy Spirit empowers us to reach out to others in order to serve God by sharing the good news of Jesus Christ. It is this truth that governs all that we do and all that we are. worship as a community of faith gathering in the Triune God’s presence to further our knowledge of Scripture, participate in the Sacraments and gain inspiration for our lives. Music is part of our worship in that it enhances the spoken words of worship in an uplifting multigenerational manner. We offer our musical gifts to the Lord. affirm that members of all ages contribute to the rich tapestry of our witness, interests and talents. We encourage others to join us. Through fellowship all members are supported on a communal and personal level as our church family gathers for many purposes. acknowledge the blessings the Triune God has bestowed upon us and we respond by offering our time, talents and treasure as a dynamic sacrifice in gratitude to the loving and caring God. recognize the importance of life long learning to further our knowledge of God and better grow in our relationship with God, our families and our Community. experience the love of God revealed in Jesus Christ and go from our worshipping fellowship into the world to serve others.